This post is sponsored by the Behr Paint Company but all opinions are my own. Be sure and read all the way through this post so you can enter the $100 Home Depot gift card giveaway! I just finished a fun room renovation project in our home and I am jumping up and down because I love it. I added new paint colors in our boy’s bedroom and cannot believe the impact it has made in the room. I reached outside of my comfort zone and went more bold than usual and I am so happy I did! Last week I realized summer was over and it was time for a new project. The double bedded boys room upstairs needed the most attention and really needed some help. If you are trying to figure out which room it is in our home, don’t worry. You have never seen it before. It was that bad. Our three boys are grown (they are ages 27, 24 and 23) and no longer live at home, but they do come home often to visit. I thought it might make sense if I reached out to our boys and asked for their input on this project. 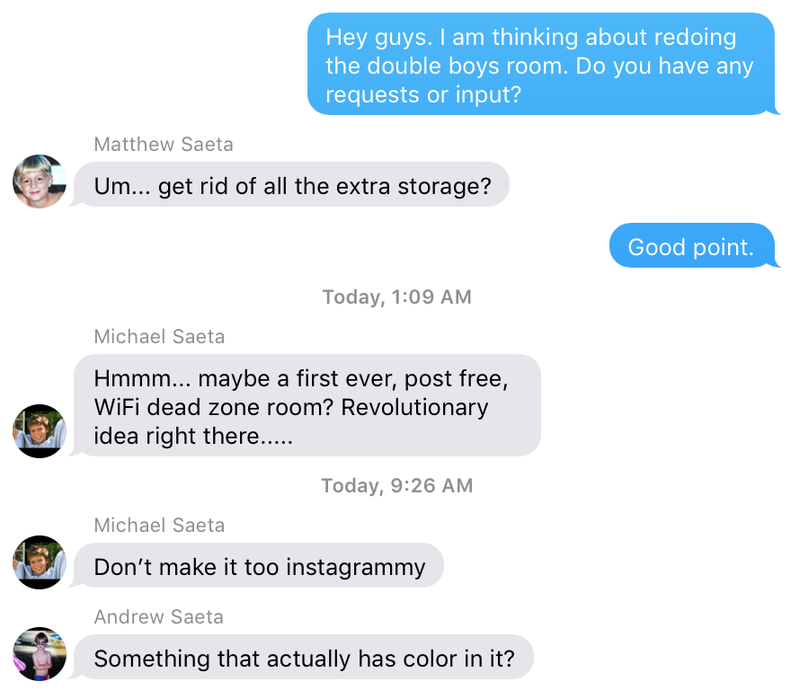 So I sent a text message to our boys asking for input on what they would like to see done to the room. After spending considerable time trying to google the term “instagrammy” I went back to the source. According to my son Michael, Instagrammy means “too much white decor, no color, chippy furniture, and no stuff”. So I decided to add color to the room with paint and try not to include too much white decor. I still intended to sneak in the chippy furniture and find somewhere to hide all of their “stuff”. But I was excited about the challenge. This bedroom in our home was an old bedroom for our boys, and then became a storage room and guest room for the last two years. This photo shows how bad it looked. The old paintings and rug were in here for storage and there was barely room for anyone to sleep. And to be totally honest, this photo was taken after I cleaned up. When most people select their paint colors, they go to the paint store, bring paint chips back to their home, hold them up on the wall, and then head back to the paint store for samples. They then paint the samples on the walls and try to decide which color they want. I had no idea what colors I wanted to try, considering my favorite color white was forbidden by my sons. Instead of heading to the paint store, I went online and pulled up the Behr 2019 Color Trends. 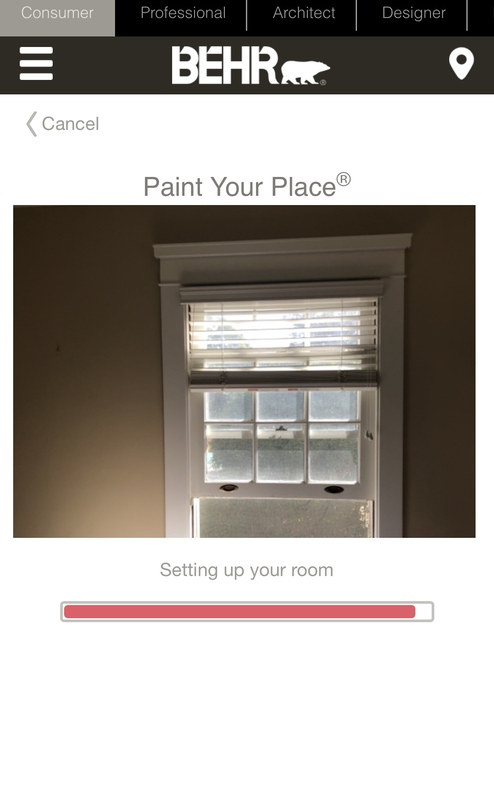 I used the Behr Paint Your Place® and uploaded some images of our bedroom and then viewed different colors on my walls. It was so easy, and I found two I really liked. 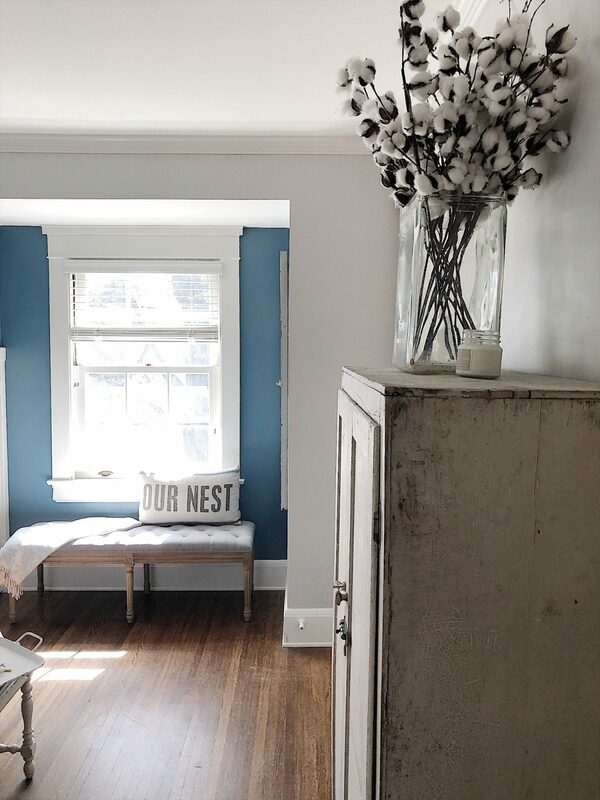 They were the BEHR 2019 Color of the Year Blueprint S470-5 and Cotton Grey HDC-NT-20. Here is the photo of the boy’s bedroom I uploaded on my computer. Here are the two colors I selected. It is so easy to try different paint colors on the Behr site. I decided to paint the room in Cotton Grey and also create a focal point in the room by painting the window alcove in Blueprint. I have always wanted to create a sitting area under the window and I love how it turned out. We picked up the Behr Marquee®Interior Paint at The Home Depot and got to work prepping the room. The hardest part was emptying out the room. There was so much “stuff” left in the room and it took me hours to sort through old college binders and junk. The prep was easy as all we had to do was patch a few holes. It only took a few hours to paint the entire room. I already had the white chippy end table and cabinet and overruled my son’s requests and placed them in the room. I gathered all of the accessories from around our home and the only purchase I made was the duvet covers. I went with minimal accessories so there would be plenty of room for the boys to be comfortable when they come home to stay. I have a feeling I will be enjoying this reading nook until our boys come home. As a finishing touch, I added one of my paintings on the wall. I thought about painting a new one but this one was just too perfect! I am sure you are wondering what the boys thought of the finished room. I sent them another text. It means a lot to me that they like the end result. I absolutely love it. I am really excited to announce that I have partnered with BEHR to give away a $100 e-Gift Card to Home Depot. It’s so easy to enter! Just leave a comment here telling me what room in your home you would like to paint. That’s it! For another entry just follow @BehrPaint on Instagram. Winner will be picked on October 15th at 9:00am PST. This is a sponsored conversation written by me on behalf of the Behr Paint Company. The opinions and text are all mine. My laundry room needs a cheerful color so I won’t dread going in there. It’s small and windowless and needs brightening. It’s amazing what paint can do! Sounds like it is a must-do paint project! The room looks great. I love the colors. I would love to paint my kitchen. I would even like to do an accent wall in there. Thank you for the inspiration. Looks great! I would love to paint our master and add an accent wall color behind the bed. Looks great! I have 3 rooms that desperately need painting: kitchen, office and master bedroom. They’ve not been touched for almost 10 years! I was in the same situation. New paint makes all the difference. Love that blue accent wall! I would like to paint my dining room. Previous owner selected a deep red. It haunts me. Deep red is dark. A lighter color will make a huge difference! Love the makeover! I have a long entryway 🛣 with no windows that needs color 👩🏻‍🎨but not sure what color to pick so that it doesn’t feel too narrow. I’ll head to the Behr site and upload a pic. Cant wait to check it out! Let me know color what you decide to use! Can’t wait to try out the Behr site’s “Paint Your Place”! It looks simple to use. I’d like to do an accent wall in our bedroom, and the blue just might be perfect. I didn’t know how my crazy idea would look until I used the Paint Your Place. I am so happy I did it! I have many rooms that need to be painted. We had a house fire 16 years ago and everything now needs to be redone! Four boys have lived here so you can imagine the wear and tear! Oh no! You definitely need to paint! My dining room is small and dark. I would love to brighten it up. Behr is my paint of choice already. Love the colors in your room. It almost looks like you have 2 separate rooms there. We are getting ready to remodel our kitchen and dining room. New paint in a new color will be definitely needed. Sounds like a very great project. The room in my house that desperately needs painting and a make over is the “grandkids” room. This room initially started out as a girls room and now the gran girls have grown up and now have 2 new grandsons ages 2 and 4. I need to make this age appropriate and yet this room doubles as the guest room, too. I need new paint and color scheme for this room. You should go to the Behr site and upload a photo of your room. It is so fun to see the colors on your own walls! Just moved into a new house with builder grade paint so my whole house will be getting new paint eventually. i think the Cotton Grey will work. I love the Cotton Grey! I now have two grey bedrooms! We are in “the process”of trying to get full custody of our little grandson.We do have legal custody and have him with us 4 days out of the week.We are responsible for all medical decisions,(he was in dire need of medical attention).We have him Thurs eve-Mon eve at this time..and trying to get all medical appointments “squeezed in”on Friday’s and Mondays are difficult to say the least! !He is 2 1/2 yrs old…We have a narrow bedroom on our main level (that used to be an office),that we are using for his room…it is in need of hole patching and paint,and a cute makeover!! !His room is the one I would redo-for sure!!! That sounds like a wonderful project for a great little boy! We are in a new home, but I am already thinking new color in the dining room. Good for you! Our dining room is the only room in our home with darker walls! I really love the change!! My 24 year old son just got married and that’s my next project is to give his room an update. Painting the walls is the first thing on the list and making it a guest room. As always your post are very uplifting and great ideas!! I am so glad you like it. It was not a difficult project! Your room came out great! I’m working on a guest bathroom and then my master bedroom and bath! I’m going to check out the Behr Cotton Grey for sure! I am in the process of talking my husband into redoing the dining room/living room. He is going to build me a large dining table and I want to paint the room a new color. I also hope to place one of my large painting in the room to make it my own. Loved your painting in the boys room. It finished it off beautifully. Thank you so much! I love it in there too! Your renovation of your young men’s room is GREAT! Love the color in the reading nook. Always love the inspiration you give in your posts! I’m about to repaint my entire home so that we can put it on the market, as we plan to retire to another state! Whoohoo! That Home Depot e-gift card would come in very handy for the huge project on hand!! Oh my gosh. You do have a big project ahead. It sounds exciting. Love it! Glad the boys are happy! I would paint my living room foyer area. That sounds like a good project! I need to paint my spare bedroom and mt master. Would be a toss up but leaning towards the spare room cause I have the flooring already and have a pretty good idea what I’m going to do in there. Just need to get moving on it!! We all have a huge list of projects. Just start in one room and take your time! I am fixing up our 140 year old farmhouse. I am ready to start on the upstairs bedroom that my grandchildren use! Oh my gosh! How exciting. I love the Blueprint reading nook; it looks great with the grey in the main room. Thanks for showing us the app–I’m going to upload a pic of our small home office. It’s begging for a bright new pop of color. That’s the room I’d paint next. I spent way too much time on the website! Haha. It was so fun looking at so many different colors on my walls. We are in the process of renovating our basement into a proper ‘rec room’ for our teen boys and it desperatley needs a paint job! That sounds like so much fun! That is wonderful. Wow! It looks so good! You did great! I love the blue…and the painting…and everything! I would like to paint my kitchen…and my downstairs bathroom …and my entire upstairs! Thank you so much! Paint can make such a difference! Love the input from your boys! I have boys and sometimes it’s good to ask them. I always use Behr and I just finished my bedroom with Norwegian blue and Swirling white. I love how it turned out. I have 10 foot ceilings so using a darker color wasnt scary. Its the only paint that covers my heavily textured walls and they are a pain! The room is beautiful! I love following you and seeing your 100 year old home. Love it! Oh gosh, it sounds wonderful! Love the colors you chose for this room. My youngest son’s room needs a new paint color to make it particularly his. He has three older brothers and usually just gets the hand-me-downs. I know what you mean! I waited until all of our boys moved out to redo their rooms. That makes no sense! Been there, done that! The clutter was so bad! Your room update looks great! I am getting ready to build a house, so i’ll Need to paint everything! Yes you will. How exciting! What a gorgeous room! Having the boys input was the perfect touch. My guestroom has been “builder’s beige” for 16 years. It, too, has been used for multi purposes and is on desperate need of a paint job. Yep, that is room I will repaint. I hesitated about asking the boys. But I am so glad I did! Great job! It looks wonderful and welcoming! I would paint our kitchen and dining room. I’ve been toying with the idea of painting our living room, as well. These rooms need new life! New paint will make such a difference! I would love to give my parents a room makeover! I work on many projects with my dad around the house, but their room has never gotten any love and is extremely outdated! It would be awesome to put a new coat of paint in the room and finally give some attention to what they won’t do for themselves. Anna! That is the sweetest thing ever! The room is beautiful. I would love to redo my masterbedroom. Moved recently and its the last room that need to be done. 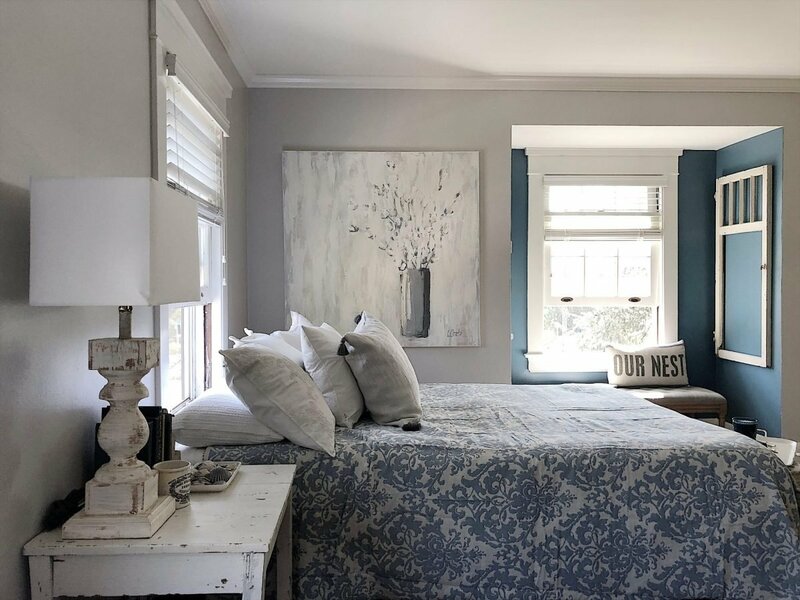 You deserve to have your master bedroom painted! Love it! We just recently bought the house my great grandpa bought and am fixing it up for our little family and it seems like every room needs a new paint job! I know it is overwhelming but just take it a room at a time. It will get painted. Our kitchen is in desperate need of new paint. We haven’t painted it since we moved in 😲 and it is not good. There are red splotches, and it’s just a mess. I almost hate being in there, and I love you cook, bake, and host guests. Just block out a day and start painting! You will be so happy when you do. Oh what a gorgeous room, You have an eye for color and design. I think that was great to include those boys in your decision. Our Master Suite has not been painted in 15 years and when I did paint it I used the suede treatment.. ah regrets and our Master onsuite bath has not been painted at all… Kids, life, grandkids other parts of our home got all the attention. It would be wonderful to have an updated look in our haven!! Oh Sandra! You need to do paint for sure! We haven’t painted our kitchen in so long! Oh, that is a great idea! Love the reading nook! Your house is beautiful. I’d love to repaint the bathrooms & bedrooms in our house. Especially the guest room. So I can finish putting the headboard up and decorate! My bedroom needs a paint job badly!! It’s my haven so I want something peaceful and soothing. The room looks beautiful!!! I am in the same situation, my two kids are grown and their rooms turned into storage! I want to paint my sons old room for when my grandson comes to stay. I absolutely LOVE Behr paint! It’s the only paint I use in my home!! My boys use to race upstairs to claim the other room which I redid this past spring. Now we can have peace! This room looks so relaxing and peaceful! I’d love to do something similar in my own bedroom! Oh, I hope you do! Leslie beautiful colors!!! I kn u said what room my room choice would be my 1500+ wrap around porch. Just painted our house with Behr from Home Depot & need to choose a deck color. Beautiful! I will be doing that soon in Waco! My basement hallway! I know it’ll look great in a blue or grey! As you know, I love those colors! I would love to paint my kitchen. 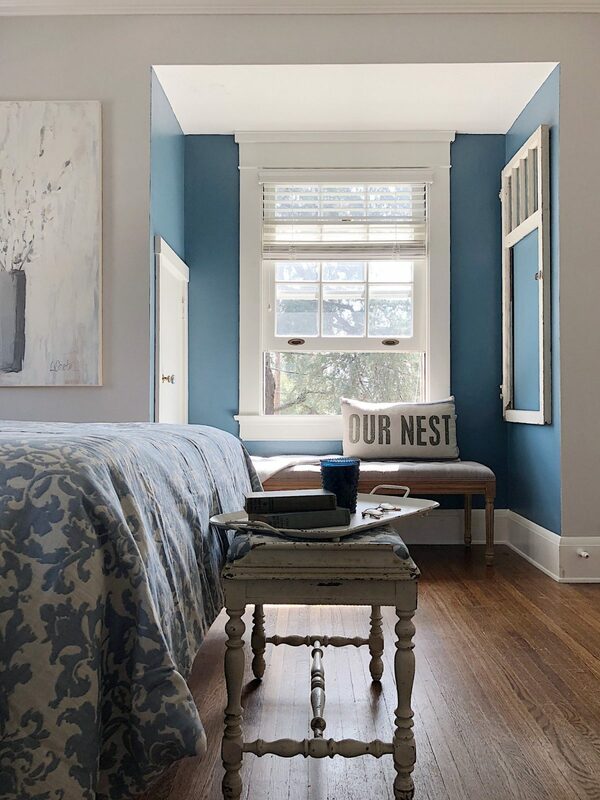 I love what you did with the room, sometimes it’s hard for me to go bold with a paint color but that blue is gorgeous. I have several rooms that need painting. All three of my bathrooms are very dated and really need a refresh, paint of course would be a great place to start. Paint is a good place to start! I know the Blueprint blue is bold but I just love it! My bedroom is the awful Navajo White that has gone yellowish and dingy. It’s terrible! I’m dreaming of a soothing grayish green. Awe. That sounds like a lovely idea! Sounds wonderful! Paint can really bring life to a room! We painted our bedroom this spring and I love it. The master bedroom and bath need a new color in my house. I love the colors you picked for your boys room. We need to paint most of the house. Moved in 3 years ago and slowly changing the colours. It takes time! But paint is such a great way to make a room pop! I live in a tiny house so color on the walls are super important.. I love the blue and have sparingly used ,a what I call country blue in my bottom kitchen cupboards. Transitioning from a large house to a tiny has been too sat the least a decorating challenge. I m sure it has been a hard transition. I do love this transformation! what a great idea! Paint is such a great way to refresh any room! Leslie! It looks so great! 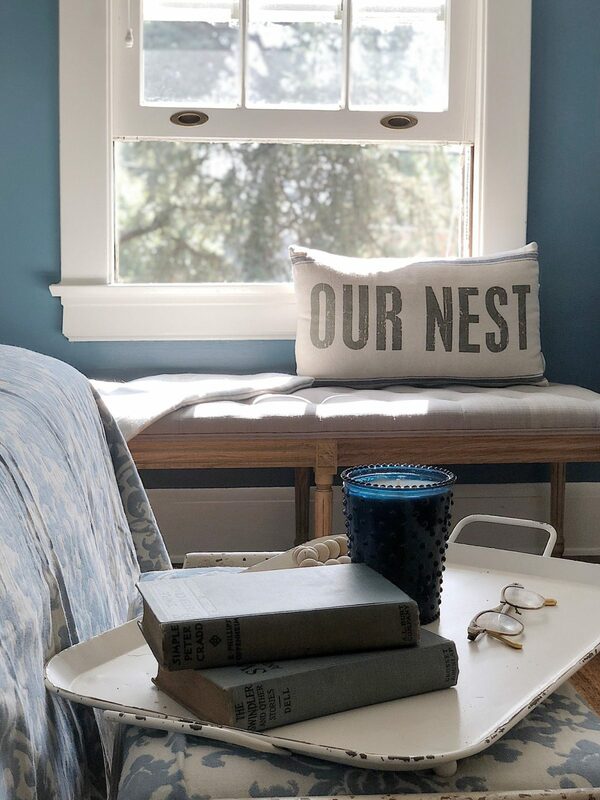 I love that blue color, I need to build out a window for a little reading nook! Thinking the hubby Isn’t going to be on board! Haha Isn’t it funny how opinion our kids are? I’m really in need of a master bedroom refresh; paint; artwork; bedding; the works! Of course, the dog believes it’s his perch, so he can look out the window; naturally Gus will need to be consulted. You’ve inspired me to tackle my spare bedroom. Fresh paint colors can make such a difference! Love how yours turned out. I need to paint several rooms in my 180 year old home! Dining room, foyer and living room! Your makeover looks great!!! Love what you’ve done to this room – well your whole home actually! I want to paint a bedroom that has knotty pine wood all over the place. Behr with primer is already our go to paint! I would love to repaint my dinning room to lighten it up. I shop homedepot and have used Behr paint in the past. Thank you for sharing. 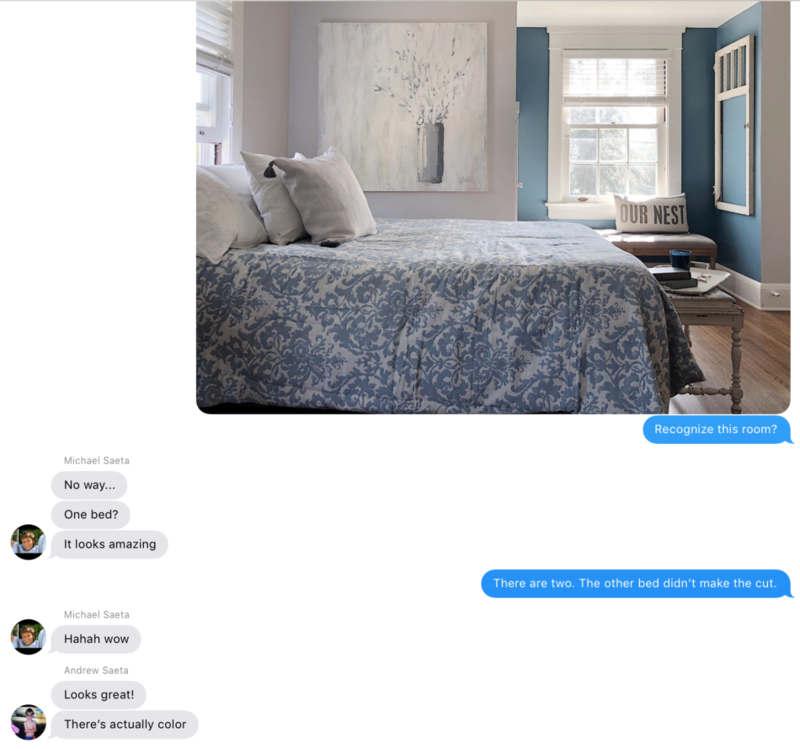 I would like to help my daughter paint her NYC studio apartment; she has already picked out a Behr paint color, Silver Drop. I had a hard time doing my 20yo sons room also. What’s great is he said it’s the best room he’s ever had.I would like to paint my kitchen and cupboards. I love Bebe paint they are the best! Leslie, Great job! I love the punch of color and the duvet cover you added to the room. Glad you took the leap and picked the blue. Love it! Room looks great . I love Behr paint – it’s the only kind I use . I worked with a Behr rep when deciding to paint all our wood white starting with our master bedroom . I have a ton of wood to paint and have just begun . I went with (Behr- Polar Bear ) which I feel is still a little bright . Can you tell me what color white you use in you house for your wood work and do you use a satin ? Getting ready to paint the hallways next week, but after that, the family room, living room and master bedroom all need painting. None of those rooms have been touched in 12 years- it’s time! We’ve lived in our home for 35 years and still love it. We’ve painted and repainted many times and am thinking our master bedroom is next on the list. Love your inspiration. I’d really love to paint my bedroom! I’m a fan of blues. I would love an accent wall in my living room, it is okay as it stands now, but with a pop of color it would be super! Well done on your son’s old bedroom. It looks great with your paint choices! Is there anything you touch, that is bad? I think not! Love the room. I would do my bathroom. My kitchen definitely needs a fresh paint job. It was lasted paint when I was pregnant with our daughter, who is now 20 years old. I would love to paint my sons room. Sadly it is still light purple from the previous owners. Oh, gosh, all our rooms could use new paint! But I’d start with the stairway, which is dark and sad. Love what you did in the room and your painting! My bedroom needs a new look and I have been wanting to add color to it! Your experience with Behr andthe new color for 2019 seem great and user friendly! My master bedroom needs a total refresh in color! I would paint my living room and dining room. I want to lighten them up so I’m looking at shades of white….there are SO many! I want to paint my master bathroom! I’m thinking of going instagramy lol. I want to do white! It’s robins egg blue right now. Getting tired of it! You always do these little projects at the perfect time. We bought a new build a year ago, I’ve been dreading the color in our home. But I know I cant just repaint the whole inside to my liking. I would love to start with my master bedroom, it’s my happy place that just needs some color! My bathroom is up next! I want to repaint our guest room/office. We painted it red 16 years ago. Basement bedroom and bathroom. Our three kids are about the same age(😄) and we too are chipping away at transforming their childhood spaces into “return home” guest rooms. It’s a fun transition! I would love to paint and redo my laundry room! This looks fab! I would love to paint what I call the “yellow room.“ This was my girls’ room when they were little. I had the top creamy and the bottom a green with a wallpaper border at about chair rail height. I have since painted the room yellow TWICE after using a primer over the green. I still see a shadow where the green and cream met. I would love to paint my bedroom if only I could get my husband to agree with me on a color! I would love to paint our office/guest room. It’s not used alot, but is so need of a refresh . I love the color of grey you used. The room looks great! I love the blue nook! And your sons’ comments are great. 😂 Its great that they liked it. I need to paint our dining room trim and the foyer. Desperately. Love the color! I am so tired of looking at off white walls so i would paint my living room! I would love to give my master bedroom a refresh going from blue walls to white. It only has one window so it feels dark. After 2 boys, (my youngest is 6 months) my self care is in need of a little TLC. I must repaint the dining room! 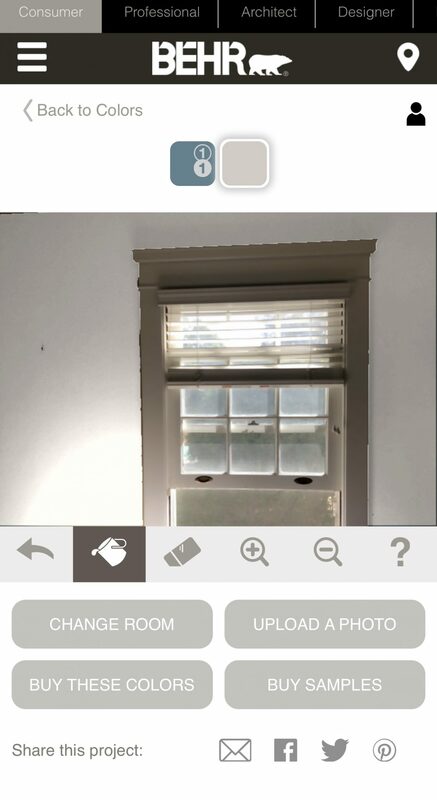 I was hoping to warmup this North facing room and choose a shade of green that looks lovely in night lighting but HIDEOUS and glows in daylight. I’ve been living with it for 5 years because I don’t know what color to use. I think Behr’s Paint Your Place is a great place to start the selection process! Your guest room looks beautiful! Great job. I am in the process of trying to figure out a color for my master bathroom. My bedroom is blue, but my gut tells me blue would be too dark for the bathroom. I think I will try loading a pic on Behr to try different colors. Thank you for the tip and all of your inspirations. Have a wonderful day. I’ve used Behr paint forever and really need to find the right color for my master bedroom. I went with a dark gray but it wasn’t a good gray, too much green, now I’m on the search again for the perfect gray. Time to say goodbye to the 1980’s floral wallpaper in our open stairwell and hello to some new paint! Love the colors you chose, looks fantastic! This is beautiful!!! I love the blue color you chose too. I think i would love to paint my livingroom/kitchen area. It could really use some fresh paint!! Thanks for sharing!! Your room turned out beautiful! I’d paint my master bedroom and bathroom. Oh goodness, my living room is so in need of an uplift!! Will be checking out the Behr site for that try the color feature!! Thanks! I really REALLY need to paint our master bedroom. 15 yrs with off white walls & a window treatment re-purposed from a prior home. The ceiling are angled & very high. It’s a contemporary look that runs counter to my traditional preferences. I like a quiet palate but I want something elegant & French & gorgeous. Where to begin with color. I’m liking the blue in the bedroom. Well done. Bathroom. My bathroom is a room that I’m having a difficult time deciding on what color to paint. That’s the room that needs the most help. My kids/hall bathroom is red on the bottom, white on top, with black on the baseboards and middle trim. (Texas Tech colors). Not instagrammy at all. I bought the house like that. I’ve worked & lived with it for 2 YEARS now. I would LOVE to paint that bathroom!!! Looks great! Definitely NOT instagrammy! My bedroom hasn’t been painted since I built my house 15 years ago. I just started looking at colors this week (grey) and one of my co workers recommended the behr marquee. I had only looked at the home depot site and didn’t know I could upload a photo to Behr. I will be doing that right now! I love it! Every room in my house needs to be painted! I would love to paint our stairway (sooo many scuffs on the wall) or kids room. Love the blue! Wow Leslie it’s absolutely beautiful I love the pop of color in the alcove. I’m a Behr paint fan all the way. I love the painting. Oh my gosh I didn’t even realize that you paint. I can only imagine that the hardest part of redoing this room was going thru your sons things…as I’m a mom of 2Sons 31and 24. When we sold our home that was the most emotional part of the whole move. Again great job. I’m just finishing up an 8 month long, full gut, kitchen renovation. I used Behr paint in the kitchen and loved it! The Behr ceiling paint is the whitest white! I love it! Now my dining room is looking pretty drab. Time for fresh paint to compliment the new kitchen. I’m sure the living room will have to be next once the dining room is done. The Behr gift certificate would be great since the kitchen ate up most of my budget. We are renovating a Lakehouse so we are painting every room. But the next up is the kitchen. Beautiful pop if color!! Thanks for always sharing amazing things ! A triumph! You have definitely defeated your fear of color, and the result is fabulous! The family cottage hasn’t been touched since 1974. It needs a lot of fresh paint! Painting the living room and dining rooms where we’re putting in hardwood floors. The paint has been the same for about 20 years so we’re looking forward to an updat. Almost every room in my house needs painting – it’s been 11 years for most and they all need a little updating to more current colors. But first up would be the main living area. My home office for sure! It could use a punch of color! The whole house needs to be painted and I would love to start in the kitchen. Oh my goodness what a transformation. 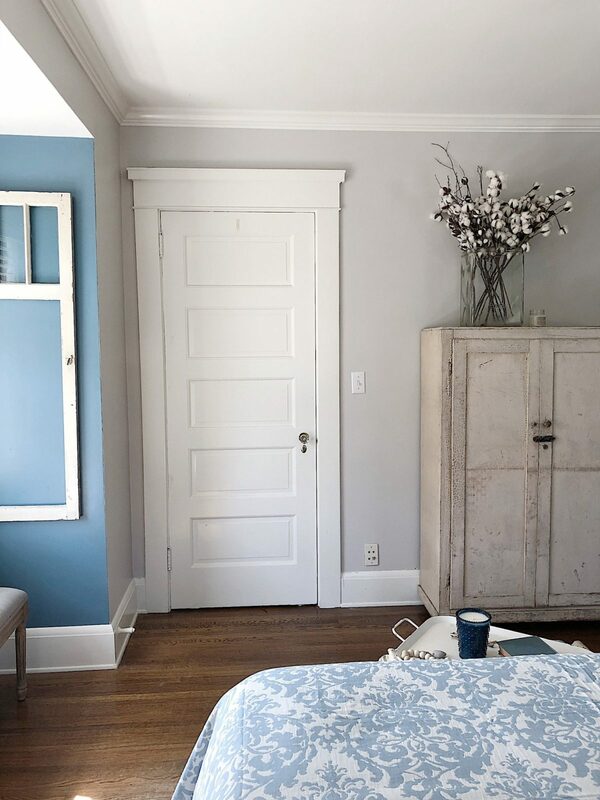 I have not painted a wall in 20 years and I REALLY want to start redoing the builder beige. 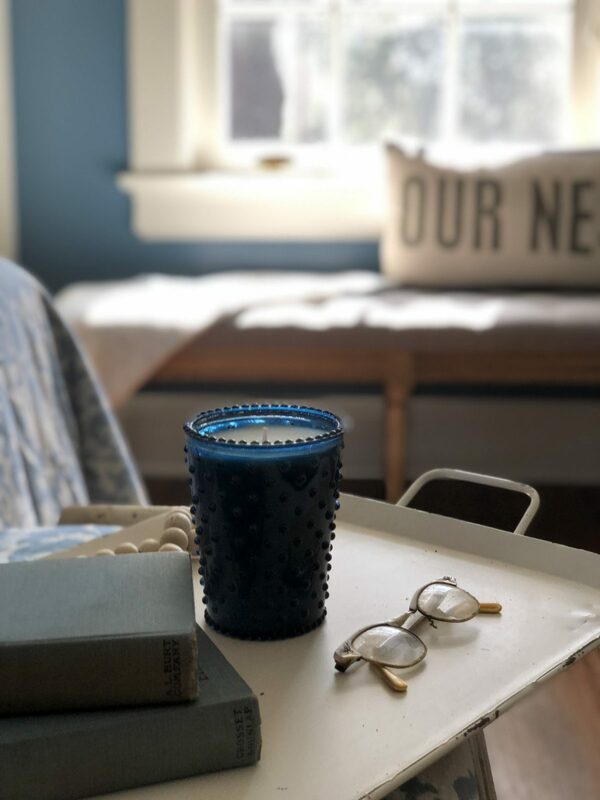 I am so glad you showed how to do this, because I would have been that person with samples all over my walls and this blue is EXACTLY what I think I want! Thank you so much!!! I would love to paint the trim and doors in my house white! Room came out beautiful! My husband and I bought a 1922 Craftsman style home, last November. We’ve been here almost a year and have only managed to paint the dining room! I love what you have done to the boys’ room. It’s so amazing, light, and airy!! I would love to paint my front living room! It’s a dark taupe….certainly not my color of choice. We’ve just had so many other things to tackle with the house so far,….now that things are settling I hope we can paint . Can’t wait for fresh changes! Congrats Jamie! You won the $100 Home Depot gift card! Please reach out and send me your address and contact information. Looks great, Leslie! You are so talented! My sister and I are going to repaint a couple rooms at our old family cabin in Northern California, next summer. I’d love to paint my adult daughters’ girls room! The room transformation is amazing! The painting really was the perfect one for your boys’ room. Also, the pop of blue is so pretty- both colors really turned out great. I love the color combination you chose! It is such a calming room. Love your decorating style! Looks beautiful! 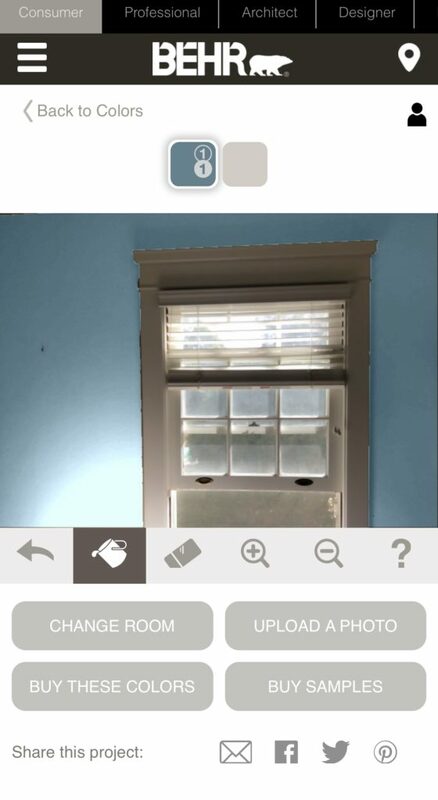 Love your posts we put an offer on an 1859 house and my fingers are crossed we get it and I can use this blue and grey color scheme for my boys room! Moving into a townhouse house, every room is white. I need color in my bedroom. Also loved the boys room. And I loved loved loved the painting. Perfect. I love the shade of blue you chose. It blends so nicely with the rest of your gorgeous house. 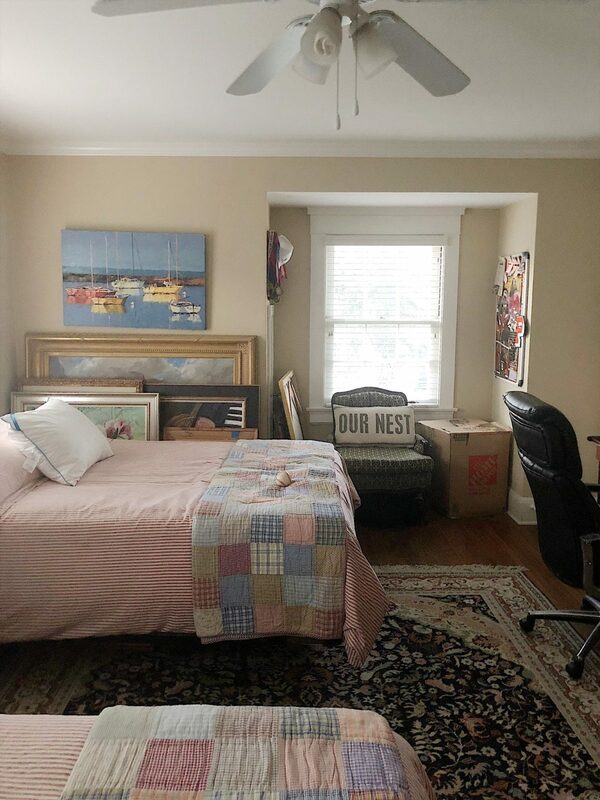 My husband and I live in an 1880s Queen Anne Victorian in coastal NJ, and after 2 years of infertility challenges and miscarriage, it looks like we will finally be able to set up a nursery. I think this is the perfect pop of color for a little one. I love how your sons room turned out! Our son’s bedroom and our living room need to be updated. Our son plays hockey and it really needs a fresh look, it has that baby blue color that I painted it when we moved into our home. It’s ready for that updated teenage look. I love the colors you used! We bought our house two years ago and repainted some of the rooms including our baby boys room. He turns one (today actually!) and we’re ready to undertake a new project….repainting our living room! It’s a beige/brown combo and we want to update to grey tones. However having a baby doesn’t give you a lot of financial wiggle room! Our master bedroom. Getting ready to redo the master bath and will need to change the room color as well. My son’s room! He’s been wanting it blue and this blue is perfect. I would love to update my living room walls! Your room makeover looks amazing!! I would paint our master bedroom since it’s all white walls! My kitchen needs a refresh! Thanks for the chance to win! I’d love to redo my living room and kitchen! Thank you for the opportunity to win! My daughters room, she loves the gray. I’m redoing my bedroom and master bath. Really needed ideas and will try the Behr app. I’m usually a BenjaminMoore gal, but hearing great things about Behr. Thanks for the help! My basement! It is pea soup green!! Awful color for a space with tiny windows! Thanks for the giveaway! I am planning on painting the office. I am trying to find colors that keep me focused and able to concentrate without falling asleep. I really would love to repaint the bathroom! I am trying to find the right color for a small bathroom, and to pick a color that brightens it up. My entire condo needs to be painted. It is on the water, so I’m looking for beach colors. Love the duvet. Where did you get it? I’m redoing my room after the kids have also recently moved out! Our livingroom needs an update,,,,I was leaning toward colors you used! I think you convinced me that these would be perfect for my room. I’d like to know what sheen you used. It sure looks great! 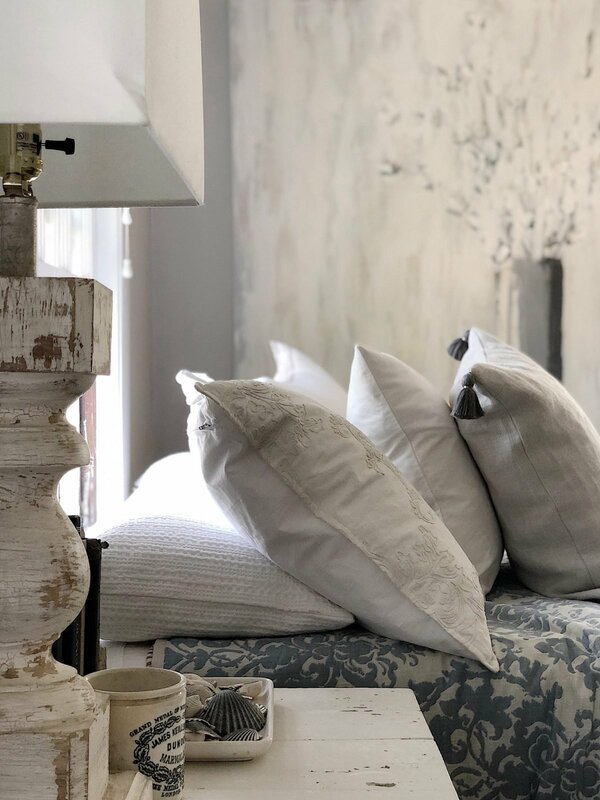 I’d love to paint my master bedroom the colors you’ve chosen, I have a similar outlay and I have used gray throughout my house and need a pop of color, love the colors you came up with ! I’m a Interior Designer from Indiana, and I’m with you on using white alot, but also with a son it can be hard to please. I asked him yesterday what kind of color would he like in his room. I thought for sure it was going to be blues. I was so wrong. He said red, to my surprise. But the room I need to do is much harder than that for me. It is a room that right now is a catch all. I need a small office in there for a time being, but also it is a place my mom and son use. It’s not a big space, and even though small I still would love to do something dramatic. Maybe a gloss on ceiling or walls. Red! Wow. Good for him. Sounds like a fun project. Love these colors. Totally going to use them in my master! Oh that’s so great to hear. I love those colors! I love those colors! I wish my bedroom looked that nice, gives me inspiration. We recently bought our house and EVERY room in the house is contractor’s brown, it’s so terrible. I have managed to get my livingroom done but the kitchen, dining room, both of my girls rooms and my room and both bathrooms need painted still.